This is a guest post by one of the bravest women I know, Jenna Bell. Read on, and learn to take time for yourself, it can save your life. Listen to your body. Doing that saved my life. When I was 23 years old, I started to experience episodes of rapid heart rate while doing menial tasks such as typing at work or making frosting for a birthday cake.I felt like I had just finished sprinting; My heart would pound. There was a lot going on in my life, I was convinced it was just stress; I was away from family, living in Atlanta and they in New York, and my boyfriend, now husband, was on the 12th month of a 15th month-long deployment to Iraq. I was a full-time teacher, part-time master’s student, and part-time retail associate. Just in case, I went to the doctor. The EKG he ordered came back a little abnormal. “You’re young, healthy, and not overweight. I’m sure it’s nothing but let’s have a cardiologist look at you,” he said. At my first visit to the cardiologist’s office the receptionist asked me if I was lost. Clearly I didn’t look like their typical patient. I was, however, and after a week of tests they determined that I had a cardiomyopathy, a weakening of the heart muscle. My heart was dangerously weak and I was at risk for sudden cardiac death. Listening to her body and making time for herself saved Jenna’s life. I was given an external defibrillator which I referred to as my ‘jetpack’ I looked like I could take off at any moment. I wore it from May to July of 2008, when I had surgery to have an internal defibrillator implanted. I was told I would never have children, my heart was too weak to sustain pregnancy and delivery. I was devastated but determined to somehow fix my heart. I was committed to a salt-free diet, exercise, and medication. By 2010 my cardiologist and a perinatologist gave me the blessing to try to get pregnant; through hard work I had partially repaired my heart muscle. My beautiful baby girl was born in 2011. However, following the delivery of my daughter, which had to be supervised by my cardiologist as well as my ob/gyn, my heart muscle was damaged again. I’m back to square one, working very hard to stay healthy; which includes diet, exercise and medication. Eventually I will need a heart transplant, for now I take care of myself. Moms are the worst at taking time for themselves, but if we don’t learn to take care of ourselves we won’t be around to take care of others. Heart disease is serious; it is the No.1 killer of women and more deadly than all forms of cancer combined. One in every 3 women will die from heart disease. The video “A Little Heart Attack” featuring Elizabeth Banks, a supporter of the American Heart Association’s Go Red for Women campaign, shows some of the more uncommon signs of a heart attack in a woman; Men’s and women’s don’t always present the same way. Heart disease can affect you, your mom, sister, daughter and all the women in your life. Educate yourself about heart disease and your risk, it can save your or your loved ones’ lives. I’d be happy to answer any questions or help you find resources in our community. 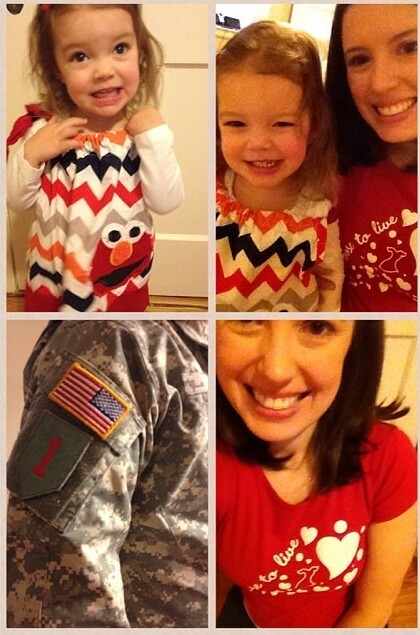 Jenna, a former special-education teacher, is currently a stay-at-home-mom to a very happy 2-year-old girl. She is married to a U.S. Army Officer and lives on post in Fort Riley, Kan. She makes a great New York-style cheesecake and loves to bake with her daughter. She is an active member of her community, volunteering with organizations on and off base, including being a national spokeswoman for the American Heart Association’s Go Red for Women campaign and an active volunteer with the local AHA’s chapters in Topeka, Lawrence and Kansas City, Kan.
Great post. I’m going through many of these issues aas well..
Heather, she really is amazing. Every time I see her, I feel like I have a lot to learn from her. Thanks for reading!